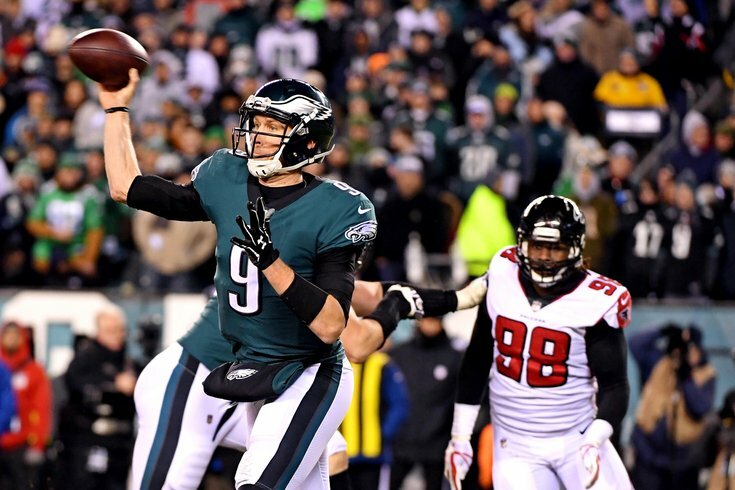 Nick Foles throws a pass during the second quarter against the Atlanta Falcons Saturday night in the NFC divisional playoff game at Lincoln Financial Field. For the last two weeks, the Eagles embraced the underdog role. Against Atlanta, they showed the world this team's success is about much more than just one player. "Since [Carson Wentz went down], no one has given us a chance. Nobody has given us a chance," head coach Doug Pederson said after the win. "And I understand, Carson's a great player, but every week our guys are hearing the same thing, that now we are all of a sudden not good enough. We're 13-3 and have the best record in football; we've got home-field advantage throughout. "Listen, it doesn't really matter what you guys talk about because that locker room is united and I'll go to bat for every one of those guys and I'll go to war with every one of those guys in that dressing room." The Eagles didn't need a lot of points – their defense took care of its job – but they needed them when it counted. And when it mattered most, Nick Foles and the offense took care of their job as well. Only six points were scored in the second half of the Eagles' 15-10 win over the Falcons in the divisional round of the NFL playoffs, but those two Jake Elliott field goals were enough to propel the Birds to their first NFC Championship Game appearance since Donovan McNabb was the quarterback. Foles, behind stellar play from the offensive line and excellent play calling from Pederson, finished with 246 yards on 23-of-30 passing (100.1 passer rating) and was sacked just once (and that came in the game's first 10 minutes). Meanwhile, reigning MVP Matt Ryan finished just 22-of-36 for 210 yards and a touchdown (86.6 rating). Foles didn't throw any touchdown passes and, at times early in the game, he looked like the Foles we saw in the final two regular-season games – maybe worse. In the second half, however, he looked more like the quarterback we saw late against the Rams and in the following week's win over the Giants. Foles also didn't turn the ball over against the Falcons and managed to lead the Eagles on three scoring drives that each lasted at least 12 plays and took more than five and a half minutes. If the defense can play like it did on Saturday – and the offensive line and running backs do their part – that version of Nick Foles is good enough to beat either of the Eagles' potential NFC Championship Game opponents next weekend, Minnesota or New Orleans. The Eagles will probably be home underdogs once again, but that doesn't bother Foles, who declined an opportunity to respond directly to his critics following the win. So what does the soon-to-be 29-year-old quarterback think was the difference between how he played against Oakland and Dallas and how he played against a Falcons defense much better than either of those teams? "I think we just kept working, we kept grinding, and it really goes back to believing and having faith in one another that we can get this done," Foles said. "There's going to be a lot of outside noise in any sport when you're doing something on a big stage. There's going to be criticism. That'll always be there, but we block that out. You're aware of it because you're human, but we did a good job of blocking it out and just going to work. "We had a great two weeks of practice, and I think that's the big thing. Preparation gives you an opportunity, but then you have to go out there an play with all your heart and give up everything you have." You also have to execute. And when it comes to that, it was a tale of two halves for the Foles and the offense. In the first half, the running backs were more involved in the passing game than the wide receivers, but things really began clicking after halftime, as Foles and Alshon Jeffery, whose only reception of the first half came on the second-to-last play and set up a last-second field goal, began to connect. After going three and out on their first possession of the third quarter, the Birds bounced back on their second drive. Pederson decided to go uptempo, and it paid off. Foles completed five straight pass attempts, including three straight to Jeffery that each went for a first down. He was suddenly stepping up in the pocket instead of turning and bailing on the play. He wasn't missing open receivers like he had been. And, with his team trailing, Foles was doing all this while throwing into the gusty wind that gave both quarterbacks trouble. The drive stalled inside the red zone, but the Eagles were able to take the lead on a 37-yard Jake Elliott field goal. They'd never trail again. Instead, they'd add to that lead with a fourth quarter field goal that capped off a 14-play drive in which Foles was 6 of 7 for 67 yards. Not unlike in Foles' only other playoff game back in 2014, the Eagles quarterback left the field in the fourth quarter with the lead. This time, however, thanks to a goal-line stand by the defense in the waning moments of the game, his team is moving on. "Nick is Nick, and that's what we've talked about and that's what he and I have talked about," Pederson said. "[We] stayed committed to the run, obviously, and that helps. And then with the passing game, just him making great decisions and getting the ball out of his hand and finding the open receiver. "He did a really nice job executing the game plan how we and how I know Nick can." In other words, Foles wasn't Carson Wentz. He was just Nick Foles. And that was enough. "You guys doubted him. We never doubted him. We never said that," said Jeffery. "We believe in anybody lining up back there at quarterback. We believe that we still have 21 other guys out there." The Eagles' motto throughout the season has been "We all we got. We all we need." Right now, Nick Foles might be all they got. But if he can turn in two more performances like this, he might be all they need.